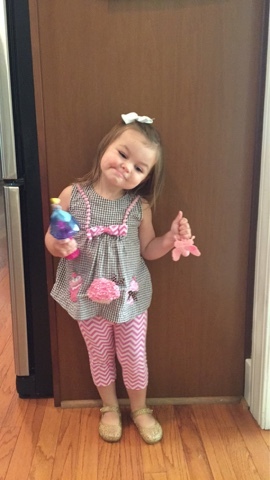 This has been an exciting week for Camille ... her first week at Summer Camp! She goes three days a week for the morning only, and they have been doing all sorts of arts and crafts and even had water play day on Wednesday! This theme this past week was camping, and yesterday's snack was a s'mores cone ... an ice cream cone stuffed with graham crackers, part of a chocolate bar, and marshmallows. This girl was in HAWG HEAVEN. How can I ever serve her apple slices as a snack again -- ha! She is loving camp so much, and it's given me a lot of time to accomplish a lot around the home and get in some great one-on-one time with Charlotte. So, recently I've had my eye on some removable peel and stick wallpaper. YEP, did you know that was a "thing"?! You get the fun of wallpaper without the hassle of putting it up with traditional wallpaper glue. And you can DIY it. And it's cheaper. Win, win, win! The seller I'm looking at on Etsy is this one and she has great reviews. I mean ... check out this option! You can even customize the color ... baby blue for a little boy's nursery, or a punchier pop of color for a small powder room maybe? Mark your calendars for Amazon Prime Day next Tuesday the 12th! Four days away! So many items (over 100,000+) are going to be on sale for Prime members. 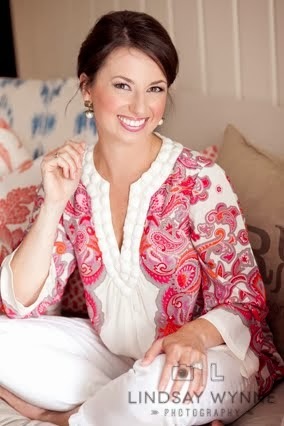 Want a peek at what's in my cart (real life here)? I've got these diapers, and this meal-planning notepad, and this portable DVD player, and a kid's bento box (in Camille's favorite color, purple!). I'll pop in to my cart on Tuesday to see if the prices have dropped for Prime Day. I painted my nails this week (a rarity; but so awesome when it happens). I used my new favorite Essie nail polish color ... the perfect pale pink! Looking for a way to burn some time this weekend? Stick your child in box with crayons. HA! Thanks to our recent huuuuuge Amazon subscribe and save delivery, Camille was able to make some very fun art last night! That wallpaper!!!!!! YES! How great for a home office accent wall!!!!! I am thinking we need some of that wallpaper in our house! My husband will just love to hear that! And that is my FAV pink nail polish! Have a great weekend! 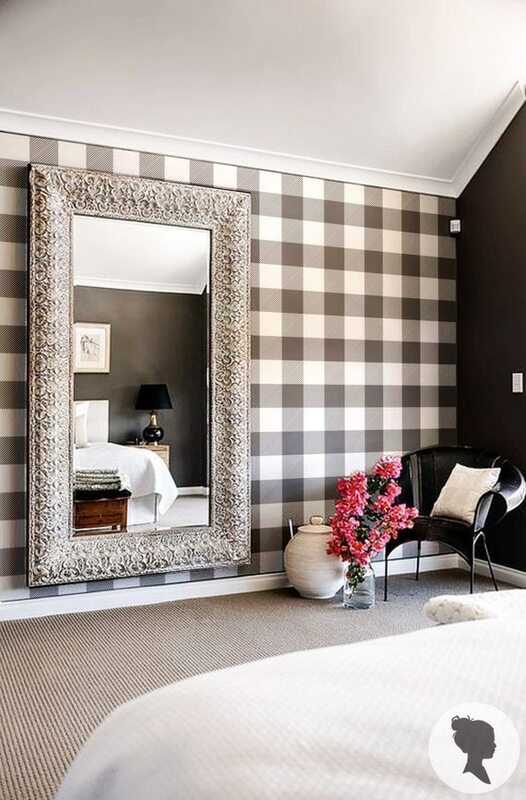 I don't know about the wallpaper but I LOVE that mirror! 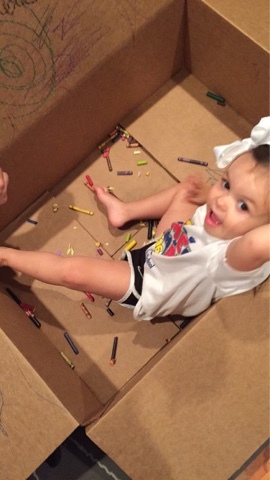 The box with crayons is such a fun idea for a child, I might have to do that when babysitting my god daughter! Have a great weekend! I actually painted my nails yesterday too, it's a miracle! Mine was a purple Essie color, I just love their colors. Glad that Camille is having fun at camp and that wallpaper, makes me want to get some too! Camille is such a doll! Both of your girls are the sweetest. Have a great weekend! That wallpaper is so neat! Love that you can customize it, too! I've been thinking about that wallpaper too! I did some gold polk-a-dots for our guest bathroom and loved it so much that I'm wanting to do more. So easy and fun! Love Camille in the box. My 7 year old can still be occupied with this activity. He makes all kinds of things. Currently, we're in the middle of Recycle City in his bedroom. It's kind of making me crazy, but who am I to crush his creativity?? :) Embrace it, I say! You found such a great source for wallpaper! I love their patterns. And Camille wearing those Nike shorts?! Too cute! Peel and stick wallpaper!!! I hope they ship to Germany, because I SO need some!!! Have a fabulous weekend!!! I would also love a post on what you subscribe and save on on Amazon - assuming diapers, but am curious to see what else you've found savings on! Always looking for deals on our daily stuff, and since we have another little one joining us in just a few weeks, I have a strong feeling that delivery will be our best options for lots of our goods!